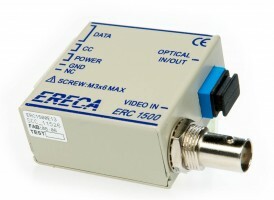 ERC 1500 are bidirectionnal transmission equipments. They allow transmission of video and data signal on one optical fiber. Transmitter is stand alone presented with low consumption powered under low voltage for integration in housing or dome camera. Receiver are pluggable in 19’’ 3U ERC 17-001 chassis or in stand alone ERC 17-SA. Receiver module are available in two or three channel version. In chassis presentation modules can be supervised by ERC 17 GUARD module (HTTP or SNMP). Up to 39 receivers can be plugged in one chassis. High quality is vouched by coding, digital filtering and transmission of the video with 10 bits (S/N = 67 dB). The AGC avoid any video setting at the installation.